What to say...? N.O.T.H.I.N.G. apart ..... BRAVO and THANK YOU, it was great !!! BRAVO for the decor that respected our theme "Magic of Flowers"
THANKS FOR ALL .... Simply. MYL'EVASIONS: An agency and a team to recommend! P.S: We'll call you back for something else soon! 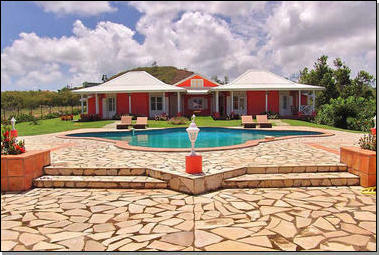 The setting of your villa charmed us, the beauty of the flowers of your island is incomparable. We will keep very beautiful memories and you promise to come back to Martinique for our wedding anniversary. 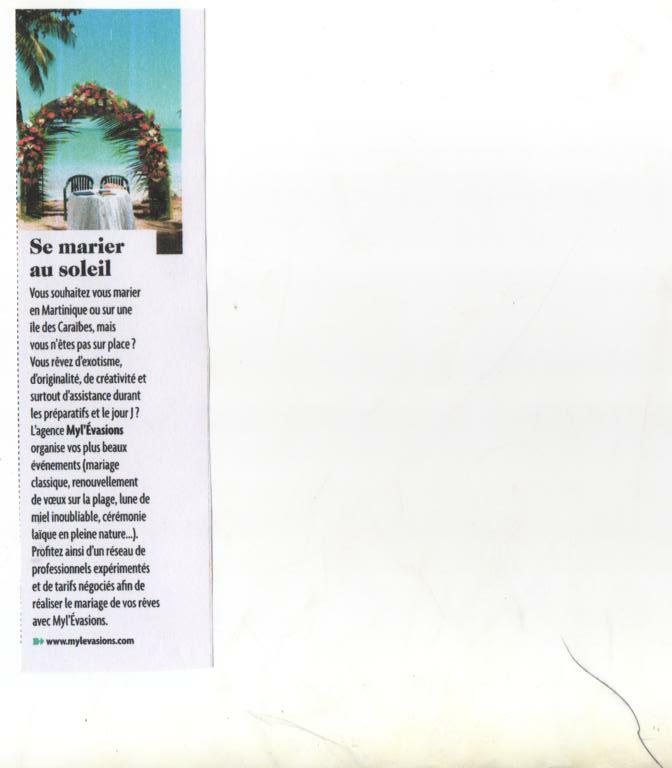 For our wedding in Saint Lucia, we had specific ideas, that Mylène managed to interpret even better than we expected and all this while being on the phone from Nice. With your professionalism and your patience, you knew how to listen to us, understand our desires and advise us on what was feasible or not while respecting a well-defined budget. You were the organizer from sent by God up above to make our wedding perfect. Dear Mylène, we will never thank you enough for all that you did for us and it is without hesitation we recommend you to all those who would like a dream wedding, without worrying about the small details. Thanks to you, we lived a dream awake, on a paradise island with all our loved ones by our side. We wanted a wedding like no other ... and had certain requirements. The MYL'EVASIONS team was very attentive to our requests and always made sure to stay within the budget we had announced. Thank you girls, it was up to our expectations. Mylene, thank you for the advice and even more for the decoration of our hotel room !!! We will keep an unforgettable memory of our wedding thanks to you, your team and our guests who for some have been your accomplices. THANK YOU for everything and long life to MYL'EVASIONS !!! 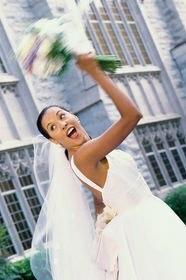 Make the most beautiful day of your life, an exceptional day is the business of these PROFESSIONALS. We found in the Myl'Evasions team the right provider for such a mission. So thanks to Mylène, for her availability, her responsiveness to the unexpected, because indeed the morning of our marriage it was not won in advance. At the end of the charming guests, parents and grooms delighted. Without hesitation MYL'EVASIONS. We greatly appreciate all that you have achieved for the organization of our wedding: the villa was beautiful, especially with all the beautiful decorations, and the beautiful local flowers. Everyone who worked on this project was welcoming and warm. Thanks to you, our day was unforgettable! We thank Mylene and Nephély very much for giving us a very beautiful fairytail wedding on the theme " Egypt". Thank you for having perfectly transcribed the universe to seek Equilibrium and Harmony in a refined and personalized manner. Thank you Myl'Evasions for your involvement, your professionalism and your listening. ..... Thank you, for your "Attitude"
"As they say, the thing was good so hold on tight and dont let go"
When we arrived at the place, my husband and I were amazed. It was wonderful!!! Thank you for everything, for your presence, your professionalism and your kindness. the organization. We regret in no way our choice, quite the contrary. stress less and all that thanks to you. Thank you for organizing this unforgettable day! We really enjoyed OUR day what many married people can not do. this event as happily as possible without our having to worry about the details. We had an ideal wedding, beautiful and sunny with all our desires, WITHOUT organizational worries. this warm and family atmosphere that we wanted so much. Do not change your efficiency and your kindness! Back to the real world after this magnificent trip to the land of the Greek gods! Thank you very much for making our wedding the best day of our lives! It was wonderful! It was Wouaaaahhhh! It was our dream! Thank you to all those near and far who have made this day an artistic feast (Organization, cake designer, photographer, makeup artist, hairdresser) .... a feast of music (The DJ !!! It is too strong it put a sick atmosphere!) ... a culinary feast (Bravo to the caterer). Thank you Mylene for your valuable advice throughout our preparations. Everything was perfect thanks to you! We will never forget.